I introduced Barbara Kopple at the Cinema Eye Awards in New York this past January, where she received the Legacy Award for her 1976 film Harlan County USA. 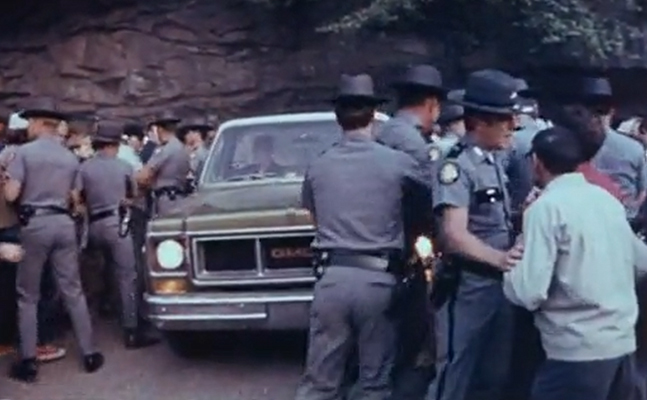 I'd lost track of how many times I've seen Harlan County, but I decided to watch it again before the event. It fascinates me how seeing a film again can strike you differently each time you see it. Harlan County USA reflects the essence of our craft. The editing masterfully weaves together the stories of the miners, their wives and the complicated history of the United Mine Workers. The music of the coal miners is organically woven into the film. And Hart Perry's cinematography is unflinching and intimate. Kopple and her crew are rarely seen or heard in the film, but they are present in every frame. At a climactic moment in the strike, the film crew is attacked, along with miners and their wives on the picket line. There are a few frames of film that show Kopple stepping in front of the camera, swinging her boom pole at an attacker who had pushed her, then the camera, to the ground. The following scene, back at the union hall, is filled with anger and fear. We can feel Kopple and her crew in the room, not observing but sharing the anger and fear of the miners and their families. Another haunting scene in Harlan County comes near the end, when the strike has turned bloody and a young miner is killed. We see the open casket, and we see his mother break down, pass out and get carried away. But we don't see these events from a distance; we're right beside them. The camera isn't merely an observer; it's a mourner too. These scenes speak to the authenticity of Kopple's work, in Harlan County and beyond. She forges real relationships and creates genuine trust. She is unafraid and fully present in the world of those she films. Kopple is not an activist but a storyteller; she tells stories that move people to act. When I first read about Harlan County USA, I didn't expect to be so moved by a film about coal miners. But these men and their families—the humanity of their struggle for justice—inspired me deeply. When Kopple received her Oscar for Harlan County USA in 1977, she said, "I accept this award on behalf of the miners of Harlan County, who took us into their homes, trusted us and shared their love with us. And it is their commitment and loyalty which is honored here tonight." Harlan County USA is a vibrant tribute to a filmmaker's undying persistence to tell a story, and a community's unwavering fight for justice. Kristi Jacobson is a documentary filmmaker and founder of Catalyst Films. Her most recent film, A Place at the Table, won the IDA's 2013 Pare Lorentz Award. Previous films include TOOTS, a critically acclaimed portrait of the filmmaker's grandfather, Toots Shor, and her debut film American Standoff for HBO.